"A great little appetizer that is fresh and yummy all at the same time." Use a melon baller to scoop out the center of each cucumber slice, leaving the bottom of the slice intact to make a small cup. Place ham, mayonnaise, Dijon mustard, and curry powder in a food processor and pulse a few times to mince and combine the filling. Spoon about 2 teaspoons filling into each cucumber cup. I loved the look of this appetizer, but it could use a kick. 4 stars for the great idea. But I used the recipe on this site for "Ham Salad Spread" that includes finely diced celery, sweet pickle relish and chopped hardboiled eggs. Used leftover Costco ham that had been braised in a sweet orange sauce. 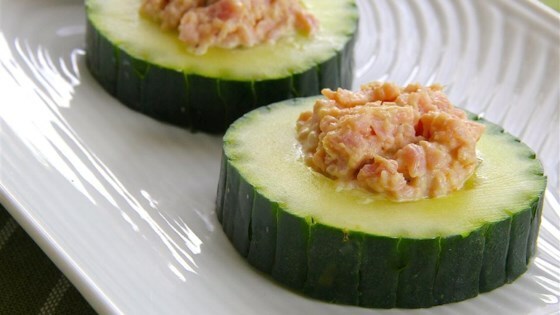 To save time, I just cut the cucumber in slices and put a scoop of the filling on top. So good and so simple and quick! Tihis is soooo good! I added more mustard and less mayo so it wasnt as sweet. Served with cucumbers and crackers.